Corby Town have signed former Harrogate Town and Nuneaton Town midfielder Anton Brown. Steelmen boss Tommy Wright played alongside the 27-year-old, who also played in the National League for Alfreton Town, at Harrogate and he has now become the latest summer signing at Steel Park ahead of the Vanarama National League North campaign. Brown’s arrival comes hot on the heels of the signing of defender Duane Courtney, which was confirmed at the weekend. And Wright is delighted with the way things are shaping up ahead of the new season. 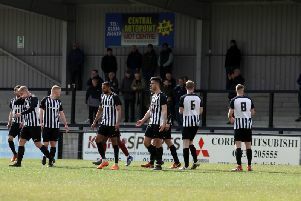 “Anton is a player I have tried to bring to the club since my appointment and I am delighted to finally get him to the club,” the Corby manager said. “He has had two frustrating seasons at Harrogate and Nuneaton and is now looking to get back to enjoying his football and is relishing a partnering with Cleveland Taylor in the middle of the park. They played together at Harrogate and are good friends. “He is a powerhouse midfielder and, like Duane, has added more steel.